Jeff Cardiff, aka the Spy-Chief, is an agent with the F.B.I. Cardiff is also known as the Spymaster (or Spy-Master) and also later known as the Cloak. And many of the people who work with him or who call upon him for assistance know him just as himself, an experienced and capable member of the Bureau. What his background was before he went to work for the government is not known. We do not learn of any relationship he might have outside of work (although he is appealing to the ladies he meets and he is not above being pleased himself) except for a brother we learn of some time in the series. As his exploits continue and the prowess of his investigative abilities, not to mention his fighting skills, become known, the enemy spies in the country put out the word that he is to be shot on site. Cardiff begins to realize his fame is working against him. When he is forced to take a vacation after getting shot. he visits his wealthy brother. That collector of war-time curios has a cape and cowl ensemble he says was "worn by a noted American spy during the Revolution." According to the story, the man himself The Cloak as well as claiming he was the "Champion of Liberty". Knowing he was a marked man as Jeff Cardiff and could not serve his country as he would like, Cardiff became the masked spy-fighter, The Cloak. Rex still knew who he was. 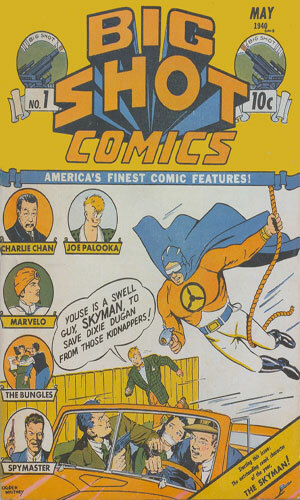 In Issue #15 and #22 at the end of the Spy-Chief comic story, each issue had a two-page text story dealing with Jeff Cardiff. Found in Big Shot Comics #15 - Jeff Cardiff, Spy-Chief, is sent to a new Army base in Georgia to find out who was behind a series of sabotages. 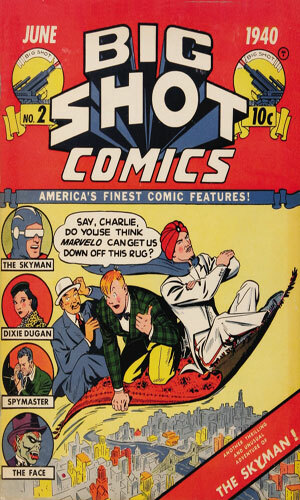 Found in Big Shot Comics #22 - Opium smugglers are the target for Jeff Cardiff and the F.B.I. 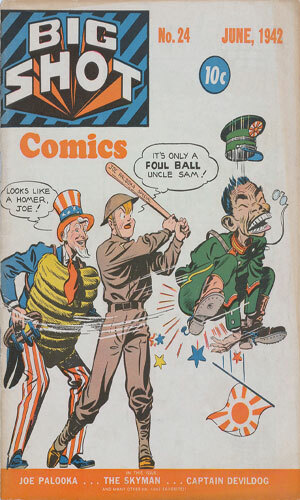 The company Columbia Comics was a one-magazine player in the comic book industry of 1940. 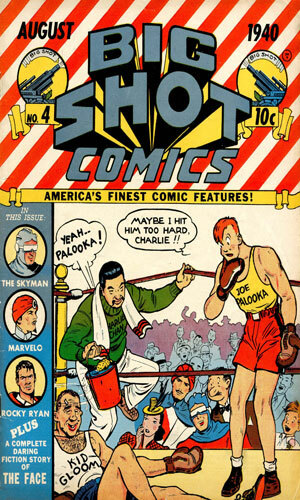 Its one entrant was Big-Shot Comics which was a mixture of comic strip reprints like Joe Palooka and some original characters. The most famous of these original folk was The Face, a masked crimefighter whose real identity was Tony Trent who was an announcer for radio station WBSC. He fought miscreants of all sorts after putting on a hideous mask with a green demon face, flaming red hair, and darkened eyes. He also had fangs. To offset this scary visage, he wore a tuxedo. 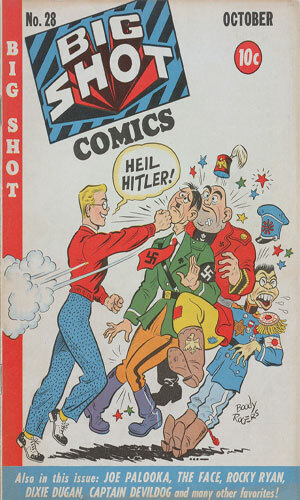 One of the other people detailed in the pages of this comic was the subject of this entry, Jeff Cardiff, a spy who apparently did not like the first tag-name he was given so he changed it. 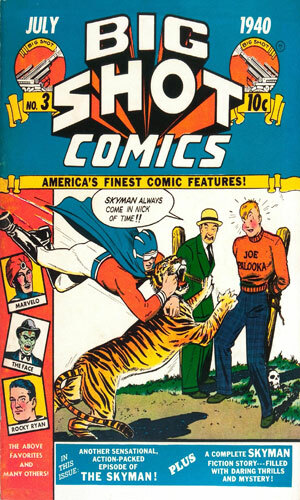 In the first two issues, he was billed as Spy-Master but from the third issue on he was known as Spy-Chief. 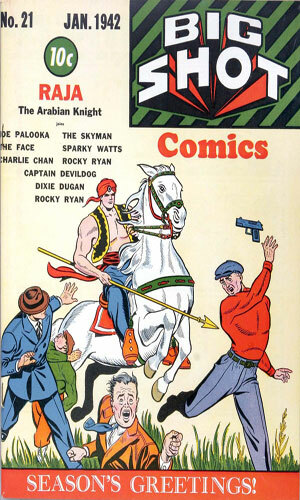 At least until issue 20 when he modified it to be Spy-Chief as The Cloak and then just four issues before he disappeared, he was just titled The Cloak. 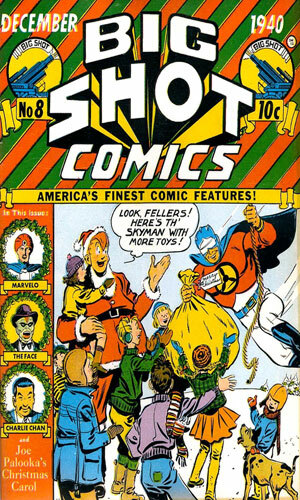 From Big Shot Comics #1 - Two crooks, Slick and Dirk, observe the Army testing a new portable "detonator gun" accurate up to 2 miles, and figure they could sell it for "som dough". Jess Cardiff is on to them and determined to get the gun back. 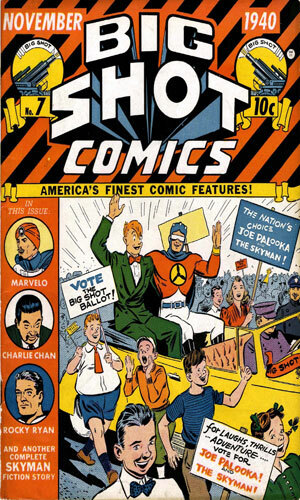 From Big Shot Comics #2 - Foreign enemy governments would like to know the secret of how the American Navy can land and launch ships on their aircraft carriers so quickly. Freelance operative Lura is out to have a big payday learning the truth. The Spy-Master is out to stop her. 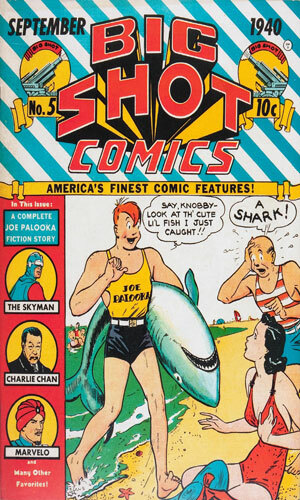 From Big Shot Comics #3 - A new fighter plane crashes into the ocean. Two spies are out to dive down and get something from the wreckage. Spy-Chief is curious who they work for. 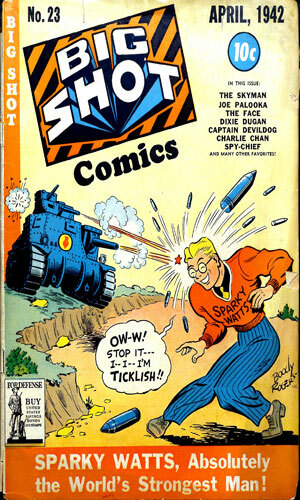 From Big Shot Comics #5 - Rumors of a possible war between two South American nations has Jeff Cardiff, Spy-Chief, sent there. He quickly learns of a plot by a rebel group to destroy American factories and ships in the area. 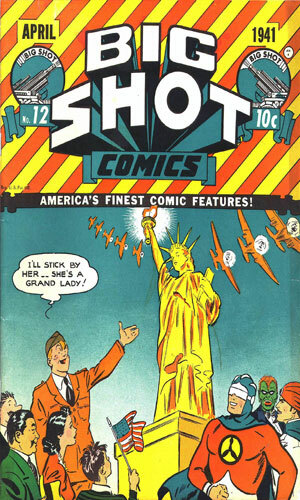 From Big Shot Comics #6 - The government is manufacturing a powerful "liquid bomb", small but deadly. Enemy agents have smuggled five out of the factory and are going to use them around D.C. as a prelude to an aerial bombardment. Jeff Cardiff is on their trail. From Big Shot Comics #7 - In the Pacific, a scientist on an unmapped island has perfected a weapon that creates a tornado from electricity and uses it to destroy ships and planes. He demands $50 billion or he will wipe out the fleet. 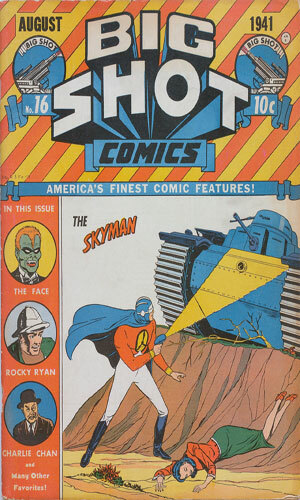 From Big Shot Comics #8 - Bombers on a test run drop their bombs on the base instead of the target. When questioned, they did not believe or remember what they had done. Jeff Cardiff had a guess what was happening and went in search of an enemy hypnotist. 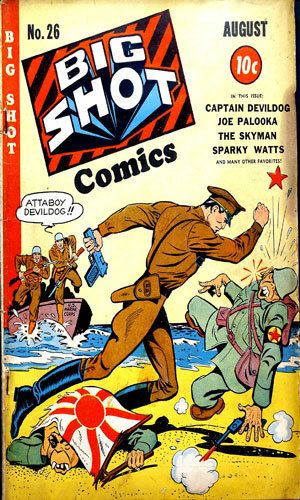 From Big Shot Comics #9 - The coded instructions to blow up a new American submarine are passed in the words of a song a beautiful enemy agent is singing to her confederates. The Spy-Chief has her number. From Big Shot Comics #10 - The head of a fighter aircraft manufacturer is worried about spies and saboteurs and asks for Jeff Cardiff's help. The Spy-Chief begins to suspect the help staff. 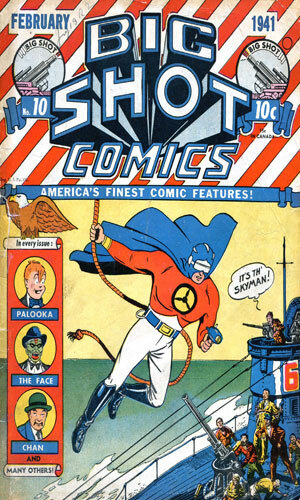 From Big Shot Comics #11 - A country friendly to the U.S. but at war with a neighbor asks Jeff Cardiff, Spy-Chief, for help to find who was sabotaging their aircraft. 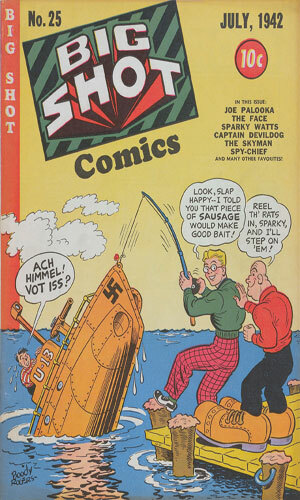 From Big Shot Comics #12 - When asked to keep an eye out for spies near the testing ground of a new submarine, Jeff Cardiff is relaxing with a bit of fishing when he catches a clue. 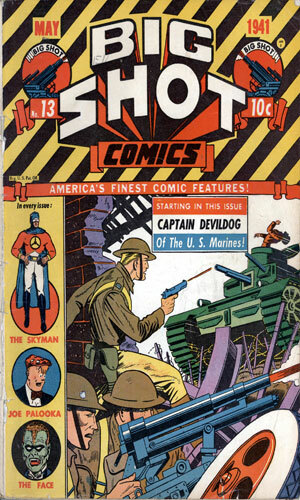 From Big Shot Comics #13 - An inventor of a new rifle visits Jeff Cardiff as he trains his dog, Rex, to be an attack dog. Foreign spies try to steal the invention and graze Rex in the process, making Spy-Chief determined to bring them down. 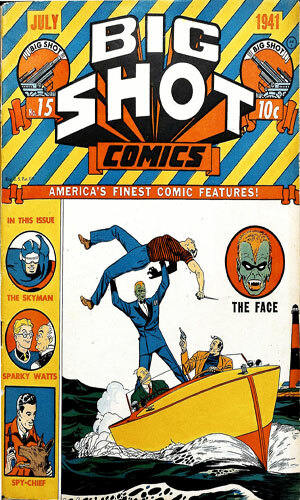 From Big Shot Comics #14 - A friend of Jeff Cardiff, Spy-Chief, is attacked after leaving a office building with plans for a new plane. Cardiff hears, though, that the report had said it was for a new battleship. Cardiff is suspicious of everyone over the discrepancy. 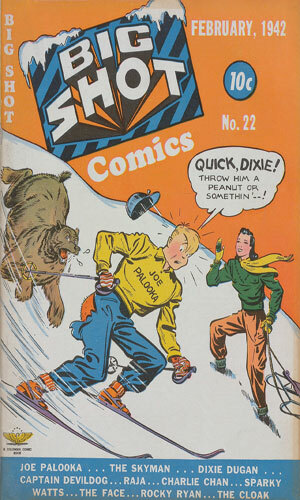 From Big Shot Comics #15 - Jeff Cardiff and his trained dog, Rex, visit the site of a factory fire, the third a couple weeks, when two men at the site recognize him and try to kill him. Surviving the attack, Cardiff learns there is a bounty on his head and he decides he needs an alter-ego. He becomes The Cloak. 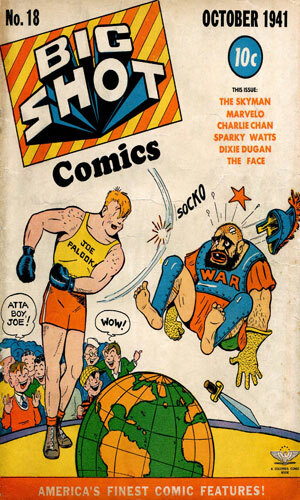 From Big Shot Comics #16 - In a far away country, visiting U.S. sailors are not welcome. Jeff Cardiff, Spy-Chief/The Cloak, is sent by his FBI boss to find out why the animosity. From Big Shot Comics #17 - Jeff Cardiff is assigned the task of finding out how war secrets are being stolen and then given to enemy agents. His searching reveals a sneak using an innocent boy's model plane to communicate with a offshore submarine. 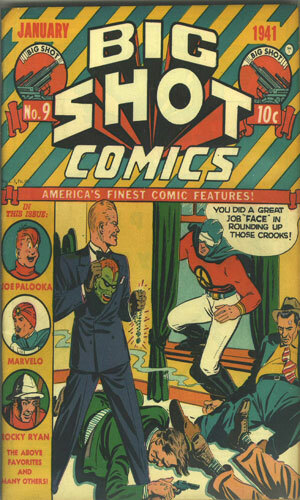 From Big Shot Comics #18 - Jeff Cardiff, Spy-Chief/The Cloak, is in Panama to stop enemy agents from blowing up a lock. 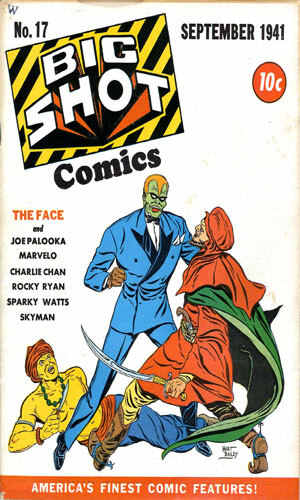 From Big Shot Comics #19 - Continuing the adventure from the previous issue, Spy-Chief/The Cloak is determined to catch von Gratzoff even though he is turning a local Panamanian tribe against Jeff Cardiff. 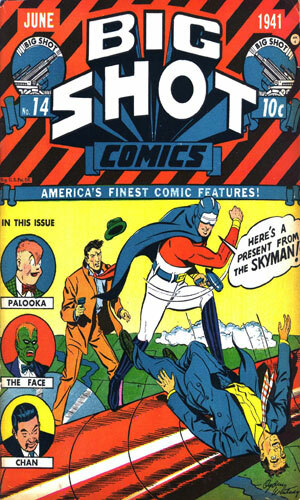 From Big Shot Comics #20 - This issue is now labeled "Spy-Chief as The Cloak". Back in the States, Jeff Cardiff is determined to catch a band of arsonists who are causing havoc in a major port. From Big Shot Comics #21 - Jeff Cardiff takes time out to tell his nephews about the original Cloak and then heads to investigate a suspected spy. The spy's buddies are waiting for his arrival. From Big Shot Comics #22 - The B-19 is the largest aircraft yet made and foreign spies would like to steal the plans or blow them up. Jeff Cardiff, Spy-Chief/Cloak, is determined that not happen. 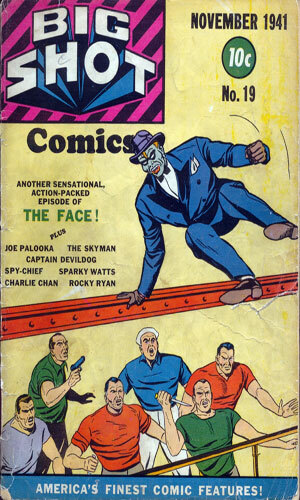 From Big Shot Comics #23 - The masked vigilante group known as the Riders of Doom are causing considerable problem and lynching those they do not like in a western US region. Jeff Cardiff, Spy-Chief as the Cloak, is determined to stop them. From Big Shot Comics #24 - Count Dunai of Transylvania is a refugee in New York but people from his homeland are out to kill him. Jeff Cardiff as the Cloak is set to stop them. 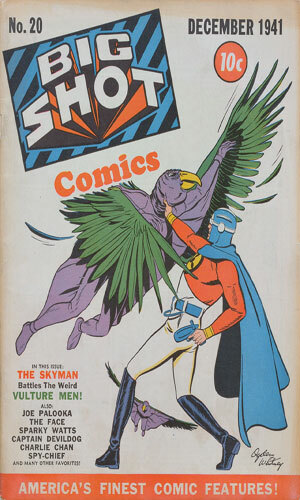 From Big Shot Comics #25 - From this issue on the title of the series was just The Cloak. Jeff Cardiff, formerly the Spy-Chief, is in Los Angeles where one vital machine-parts manufacturer is being targeted by another. From Big Shot Comics #26 - The Black Dragon Society is an assassination gang controlling much of Japan and now moving into the U.S., working with the Germans to sabotage American interests. Jeff Cardiff as the Cloak is out to stop them. 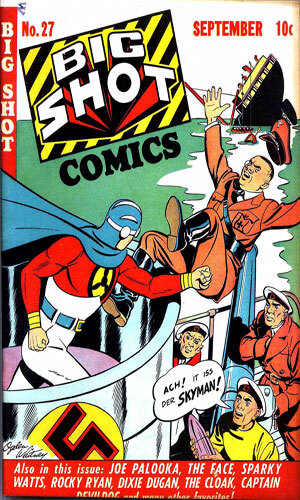 From Big Shot Comics #27 - Von Stunker is the German spymaster that was working with the Japanese Black Dragon Society. That group has suffered a set back but the German is still out there and Jeff Cardiff, Spy-Chief and The Cloak, wants him. 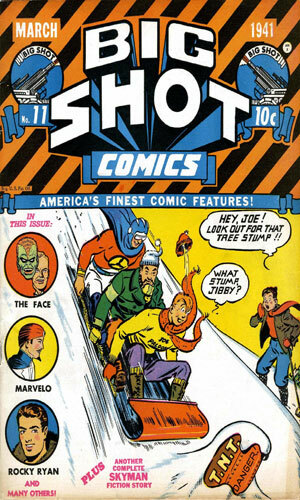 From Big Shot Comics #28 - Jeff Cardiff was invited by a Boy Scout troop to join them on a hike but in the mountains they encounter a gang of spies who do not like being encountered. One of the problems I have noticed with the spy-hunters that came out in the late 30s and early 40s is their lack of emotion. That is most pleasantly not the case with Jeff Cardiff, aka Spy-Master aka Spy-Chief aka The Cloak. He gets miffed more than once. He has a sense of humor. He loves his dog. The fare is standard but then again it had to be. America was not yet involved in war but it was close and everyone knew it could happen. Meanwhile, there was tremendous fear, and some justification for it, of fifth columnists attacking the infrastructure to keep us from helping others or from getting involved ourselves. Since we were not yet in the battle, the agents depicted had to be defensive in nature and that meant fighting saboteurs and assassins and arsonists and secret plan stealers. Cardiff fought though all the time. The big difference with Cardiff was the change a new artist made to turn the operative into a costumed hero which was interesting. The use of an identity supposedly from the Revolutionary War was a nice touch.